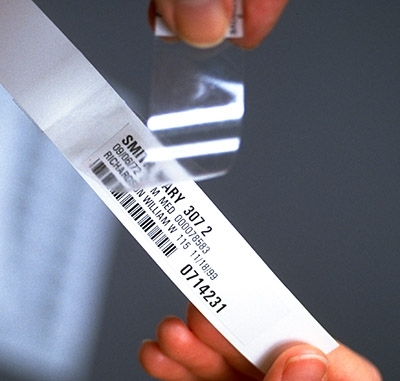 For computer labels, TabBand Shield plastic cover medical bracelets, sealing the label behind a crystal-clear plastic cover to protect patient information from fluids and wear. For write-on or color-coding, TabBand Stat! patient identification medical wristbands are available in seven colors. For delicate skin or for use with an imprinter, SoftCare delicate skin hospital armbands are the answer. TabBand also offers the Protecto-Splint, an effective, low-cost plastic finger splint. Just bend it over the injured finger and tape it in place. X-ray through it. Wash it. At 35 cents or less, these bulk plastic finger splints are significantly less expensive than metal splints.